I have always strived to make my piece of Grande Prairie a place people wanted to be a part of and focused on creating a strong sense of community. I hadn’t given politics much thought as something I wanted to pursue until this last year. It was then that I realized City Council is a larger stage allowing me to make my impact on a greater scale and reach more people in our region. What experience do you have with municipal government, in Grande Prairie or elsewhere? I know the City’s strengths and weaknesses because I lived them every day for 15 years. I worked for the City for many years and brought many ideas and proposals to Council within that time. I am very knowledgeable in not only the decision making process but also the delivery and implementation of Council directives. If elected, your term will run until 2021. What do you want Grande Prairie to look like four years from now? My heart is to see a Grande Prairie where people are invested in one another and feel a deep sense of belonging. A strong community working together can actually solve a lot of the issues Grande Prairie currently has. Corporate Services include things such as information technology, facility maintenance, and finance. City Manager’s Office includes communications, human resources, and legislative services, among others. Community Safety and Growth covers fire, RCMP, enforcement services, transportation, engineering, inspection, and planning. How would you like to see that money allocated among those uses? The distribution of funds in the above graph is closely representative of my priorities as a resident. 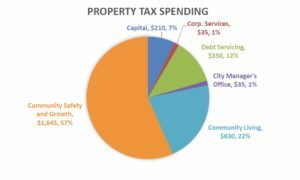 The majority of tax dollars were spent keeping our residents safe with the other large costs being growing the City in new ways and supporting quality of life in areas that already exist. While the graph isn’t perfectly accurate, it’s close enough that we can draw some safe conclusions. Unfortunately, it is the information missing from the graph that concerns me. Roughly 10% of our funds went towards debt. We, as a City liquidated saving funds that we had in the last term in order to keep taxes low. We were not successful in paying down our debt this last term and we need to give some serious thought as to how we will do that in the future. As much as I don’t want to we may have to move some finances from capital spending in order to pay down our debt but only time will tell. Many candidates talk about change but what do you think is working well in the city; what would you want to keep the same? Grande Prairie has been making great strides as of late bringing together the community. Neighborhood day may have been a baby step, but it is a baby step in the right direction! Our current Council has also invested in and built some great venues and better infrastructure for the community in the last term. These are much needed resources that the next council needs to make use of. We conducted a survey that identified Crime and Public Safety, Taxes, and Economic Growth as the top three issues for residents. What are your thoughts on those issues? These are no surprise as they go hand in hand in order to be successful. In order to make good on my promise to build Community, a person has to feel safe first. If success is a pyramid, safety is the bottom and the foundation. We need to do whatever we can to promote the feeling that residents’ wants, needs and hopes are secure in Grande Prairie. When they do they will be more inclined to put down roots and work towards Grande Prairie’s Economic Growth. We need to start at the base of the pyramid and build upwards. When voters ask “Why should I vote for you?”, what’s your answer? My experience as a long time City employee means I have a deep understanding of the systems and structure that already exist. There are over 1,000 employees who work for the City and the decisions that Council makes will have direct impact on their lives. Especially considering how many of the old Council members aren’t returning, we have to ensure that the new one is educated and knowledgeable about the consequences of their decisions. I bring experience to the table that no other candidate has. Survey Results – Thank you to those who responded!